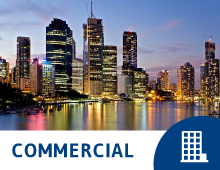 Globe Electrical Solutions are a Brisbane based electrical company with experienced commercial electricians undertaking both industrial and commercial electrical works and building projects. Globe Electrical Solutions have significant experience in working with construction and fit out companies. We are fully are aware of tight deadlines and the importance to complete works on time and on budget. We have a reputation as expert industrial and commercial electricians that deliver the works within the time frame scheduled and within the allocated budget. We are very happy to provide you with contacts for previous commercial and industrial projects that we have undertaken. Our commercial electricians are experienced in working in environments that must remain active whilst the works are carried out, causing minimum disruption to clients throughout the project. We know that businesses need to keep trading even when refurbishment or repairs are undertaken. We always ensure that there is minimal downtime and that we do not hinder the companies operations nor the companies customers during the works. As an established electrical company, Globe Electrical Solutions have access to exceptionally competitive pricing from our wholesalers. We pass this cost saving on to our clients in order for us both to secure jobs in an ever competitive market. Thus the rates charged by Globe Electrical Solutions are very affordable yet we still provide a very high level of service. Our commercial electricians tackle all jobs with skill and expertise. With Globe Electrical Solutions you will have direct access to dedicated project manager who is also a qualified commercial electrician and will always be available to assist in questions that may arise regarding any aspect of the job at hand. Contact Globe Electrical Solutions today to receive a competitive quotation for your commercial or industrial electrical works and rest assured that your job would be completed on time and on budget. We have completed a wide variety of commercial projects throughout Australia including Centerlink refurbishment in Derby WA to the refurbishment of the amenities at the Brisbane museum.